I recently found myself, once again, defending the wonderful science that Ron and everyone at the Institute have been so generous to share with us all. In this instance, the forum was a Facebook conversation (most of which can be viewed here) where PRC candidates Bill Hartman and Zac Cupples, along with myself, expressed our experiences with PRI to a group of contraians and skeptics. As a means to provide closure, I constructed a response which provides a synopsis of therapeutic intervention as well as an explanation of how PRI prinicples help me intervene. After a wealth of positive feedback via social media, Jen and Ron asked me to share it here for the brilliant community of PRI clinicians. The response begins in the quoted text below. Thanks to all of you for being such an inspiration and for positively influencing my education as a physical therapist. "It's becoming increasingly clear that the path to system variability and pain-free movement is gated by neuroception (i.e. limbic threat appraisal) and autonomic nervous system output. And its these two properties of the nervous system which govern the effects of the innumerable methodologies therapists use to expunge system rigidity. We'd hope our therapeutic inputs contribute to a modification in the perceptive capabilities of the patient, though (as we all know) this is not always the case. Some inputs never reach the level of perception while others exceed the adaptive capacity of an already rigid system, perpetuating chronic limbic hijack and sympathetic dominance. So, how do we know we're dealing with a rigid system in the first place? And furthermore, how can we evaluate the efficacy of our inputs with respect to restoring system variability? Beyond many other "systems" I've experimented with, PRI seems to provide the most cogent answers to the above questions. And it's the "umbrella" which explains, to me, why other methods work. Because interventions can be both synergistic or antagonistic to the pattern PRI presents, utilizing a withdrawal A-B-A study design during a treatment session (with the patient functioning as their own control) upholds an element of internal validity beyond what other systems might be able to provide. I'd argue this makes PRI a powerful adjunct to anything you're already doing, as we scrounge for external validity in a increasingly heterogeneous population. PRI treatment aims to recapture reciprocal and alternating movement in three planes across the three girdles of the body. 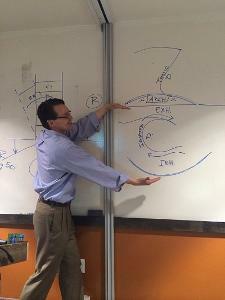 And PRI is never about fixing posture - it's about restoring system balance, variability, and adaptive potential." Launch Sport Performance is Hiring! A quick note to announce that Launch Sport Performance is currently seeking a Licensed Physical Therapist to work in our new elite facility. Launch Sport Performance is the first Postural Restoration Certified facility in Maryland and DC area. Located in Rockville, MD, we utilize and integrated approach to help athletes reach their peak. Experience with athletes is preferred, but Postural Restoration experience is a must. Recent graduates welcome! For more information, please contact Kristen Spencer at kristen@launchsp.com or 478-987-9697. For those in Colorado interested in discussing PRI, the Colorado PRC therapists Lisa Kelly, Scott Kosola, and Craig Depperschmidt are planning a quarterly informal meeting to talk PRI. Our first one will be Saturday, May 31st 2p.m. at The Point Sports Medicine and Rehab. Address is 6801 W. 20th St., Suite 203 Greeley, CO. Lisa, Scott, and Craig will be leading topic discussion but the meeting will be informal and open to the needs and interests of the group. Email Craig at craig.depperschmidt@reboundsportspt.com with any questions! Weekend in Review - From Coast to Coast! 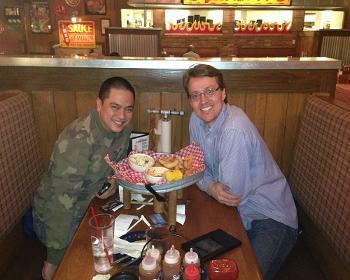 I also had the chance to eat some ribs with another rib loving PRC, Minh Nguyen! Hey everyone, thought I’d drop in a brief example of how a PRI paradigm helps me in clinic. In my practice, I treat about 25% postoperative patients. Yesterday, I began a session with a patient who is seven weeks status post right ACLR who I had been predominantly treating "per protocol guidelines" with the patient improving functionally using that approach. However, yesterday the patient presented subjective symptoms similar to those of pes anserine bursitis in the affected knee--she could not straighten her knee very well and noted end range pain, had difficulty with normal stride length on the right and could not stand on her affected right leg without severe pain in the anteromedial right knee. Objective findings showed straight leg raise 65°on the right (60 left) adduction drop test positive bilaterally, Hruska adduction lift test 1/5 bilaterally and a 20° lack of end range knee extension on the right. Patient had palpable tenderness over distal aspects of the semitendinosus and semimembranosus, noted comparable sign with resisted knee flexion. There was palpable tenderness over pes anserine bursa of the proximal tibia and noted swelling in the same area. After repositioning the patient, she had 5° lack of extension, or 15° improvement, 85 degrees of SLR, the ability to stand and walk on the right knee without pain and significantly increased step and stride length functionally. Patient was then able to perform functional closed-chain strengthening activities without pain and will now be progressed through a PEC algorithm of treatment integrated with her postoperative protocol. Though I begin implementing PRI concepts of respecting position, triplanar functional control and utilizing polyarticular muscle chains that affect postoperative care at different times dependent upon the patient, the apt time presented itself to me with this patient at the start of this session. Attaining neutral position of a pelvis gave functionally “longer” hamstring musculature, taking the strain off of the distal attachment sites of the medial hamstrings, thus decreasing pain, increasing functional end-range extension ROM and immediately allowing me to progress with rehabilitation of her right knee s/p ACLR. In this case, PRI principles and techniques allowed me to progress a patient s/p ACLR more quickly than with traditional orthopedic rehab methods alone and will improve not only the patient’s recovery from surgery, but her quality of movement and function during and after recovery. A fun session for both therapist and patient! PRI is teaming up with Southern California University of Health Sciences to host Myokinematic Restoration on May 31-Jun 1st in Whittier, CA! Don't miss the opportunity to take this course taught by Ron Hruska later this month. In addition to CE approval for PT's, ATC's, and strength coaches (through the NSCA), this course has also been approved through the California Board of Chiropractic Examiners! The early registration deadline is TOMORROW, so don't miss this opportunity. Register today online or by calling 888-691-4583!